Very good jacket. First Edition. A clean, tight copy throughout with minimal wear. No markings. Unclipped dust jacket with spine slightly sunned. Very Good. 1914: Glory Departing by Owen, Edward, 1986-06-05. 192 p. Contains: Illustrations. Good. 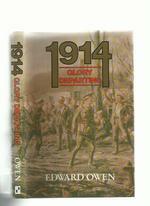 1914: Glory Departing by Owen, Edward, 1986-06-05. 192 p. Contains: Illustrations. Very Good in Very Good jacket. 8vo-over 7¾"-9¾" tall. 1st edition, 8vo, 192pp, photo illustrations, previous owner's neat name/date ffep o/w VG+ Copy in VG+ DJ the flaps of which are stuck to the pastedowns. Very Good. Hardback with dust jacket in very good condition! Some very light shelf wear, otherwise a good clean copy, appears almost like new! New. 0907675387 Brand new. Any book may show light shelf wear from warehouse storage and handling.